I was studying the ILD diagrams, trying to understand how the qui-binary adder works, when I noticed some puzzling circuitry to handle non-digit characters. I did some investigation to figure out what's going on and how addition works when you add things that aren't digits. The results are probably obvious to many of you, but hopefully they will still be of interest. Qui-binary numbers are explained on the website, but I'll give a quick summary. A decimal digit is split into two parts. The first part is one of 0, 2, 4, 6, or 8. The second part is 0 or 1. It should be clear that any digit 0 to 9 can be expressed as one value from the first set and one value from the second set. For instance, 7 = 6+1 and 4 = 4+0. 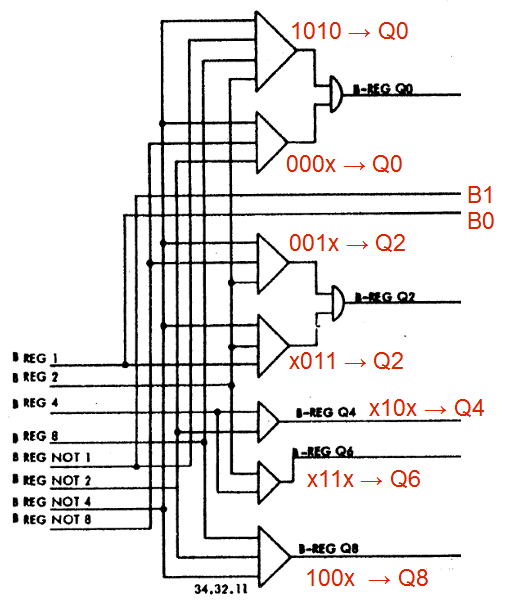 In the circuitry, each part has a control line associated: Q0, Q2, Q4, Q6, or Q8 for the first part, and B0 or B1 for the second part. One motiviation for qui-binary is that it provides easy error checking of the sum. There should be exactly one Q line and one B line active in the result. If no Q lines are active, or more than one Q line is active, something is wrong. Likewise with the B lines. By checking for no lines set or more than one line set, an error in the adder can be detected and triggers an arithmetic check fault. I've labeled in red which binary values go to which Q values. Q0 is set for values 0 (blank), 1, and decimal 10 (zero digit). Keep in mind that the digit 0 is represented as decimal 10 internally. Likewise, values 2 and 3 go to Q2. 4 and 5 go to Q4, 6 and 7 go to Q6 and 8 and 9 go to Q8. B0 and B1 are simply set from the low-order bit. But what happens when you have a character outside 0-9? Note that significant additional logic is required to handle special characters. If they didn't include this logic, special characters could trigger more or less than one Q line, and trying to add them would trigger an arithmetic check fault - the illegal addition that Stan was worried about. But with this logic, special characters add just like regular digits. Thus, to answer the question in my subject, @+# = 4+3 = 7. ¢,%='" are treated as 34567, -$. );Δ are treated as negative 34567, and &⌑(<≡ are treated as positive 34567. As the documentation says, adding a positive and negative number results in a complement add, subtracting the values. In this case, the adder generates the zone based on the sign of the result (B zone for negative or AB zone for positive). For a regular (non-complement) add, the zone bits from the B register are passed through unchanged. (The circuit for this is on ILD page 10 - data flow - and the zone bits are selected from the adder or B register by B REG ZONE INHIBIT and ARITH ZONE INHIBIT.) One consequence is that addition is non-commutative: 1 + C = D (i.e. 1 + positive 3 = positive 4). But C + 1 = 4 (i.e. positive 3 + 1 = 4). For an example of signs with special characters, adding % + $ yields A (+1) since % is treated as 4 and $ is treated as -3. Since this is a complement add, the zone is set to AB (+) based on the result's sign. Hopefully this is interesting, but let me know if it's too low-level for this mailing list. I'm glad to have confirmation of why this works. You ask if the 1620 added the same way the 1401 does. a program could add 4 and 2, and get 7 with 1 to carry. Can't Add Doesn't Even Try. Many thanks for the compendium of tips. I cherish them.